4 pcs Shrimp, 6 pcs Vegetables. All served with Miso Soup, Salad, 3 pcs California Roll, Stir Fried Vegetable, 2 Dumplings, Steamed Rice & Fruit. 22 pcs Maki: Kamikaze, California, Salmon Tempura, Crab Meat Tempura. 15 pcs Sashimi: Salmon, Tuna, Butterfish, Red Snapper, Crab Meat. 18 pcs Sushi: Salmon, Tuna, Butterfish, Red Snapper, Shrimp, Crab Meat. 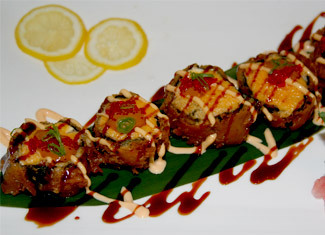 32 pcs Maki: Jungle, Salmon California, Dynamite, Green Dragon. 24 pcs Sashimi: Salmon,Tuna,Butterfish, Red Snapper,shrimp, Crab Meat. 24 pcs Sushi: Salmon, Tuna, Butterfish, Red Snapper, Shrimp, Crab Meat. 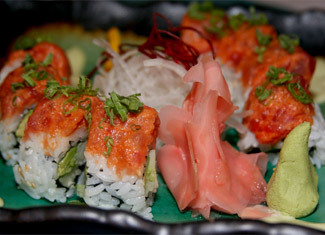 50 pcs Spicy Salmon Roll, Spicy Crab Meat Roll, Philadelphia Roll, Rainbow Roll, Red Dragon Roll Dynamite, Pink Lady.